First inspired by Van Halen's classic song "Hot For Teacher", Olney, IL native Brent Rubsam was age 7 when he first picked up a guitar in 1983, and he's been hooked ever since. Through the years he has played and sang in a multitude of bands playing everything from blues to hard rock. One of Brent's main influences over the years has been the legendary Stevie Ray Vaughan. Since the day he first heard Stevie Ray's playing, he's been inspired to develop his own bluesy & aggressive style on the guitar. Other influences include Warren Haynes, Jimi Hendrix, Buddy Guy, BB King, Randy Rhoads, Steve Vai, Eric Clapton, Tommy Castro, Popa Chubby, Walter Trout, Gary Moore, and many others. Brent currently keeps busy teaching 40 plus guitar students a week at his home in Olney, IL and by playing between 100 to 150 dates a year both solo acoustic and with a hard rockin' power trio called "Hard Rain." Brent's former band, "The Brent Rubsam Project" was sponsored by Budweiser True Music, and had the opportunity to open up shows for several well-known acts including Bad Company former lead singer Brian Howe, Dr. Hook, The Little River Band, Molly Hatchet, Great White, Firehouse, and others. Brent also currently handles lead guitar and singing duties for a central IL hard rock band called "Sleaze Factor." 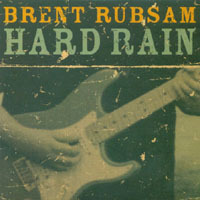 Since the release of Brent's debut blues-rock EP "Hard Rain", the disc has hit the number 10 spot on the Mp3tunes.com Electric Blues Chart, hit the number 2 spot on the IUMA Blues Chart, has been a featured CD on OnlineRock.com, and recieved some international radio airplay. Some of the stations currently spinning "Hard Rain" include "Delta Frank's Blues Blowtorch" on 103.5 FM in Peoria, IL, 89.1 WGLT FM in Normal, IL, 88.5 WVOF in Fairfield CT, "The Goodtime Blues Radio Program" FM Fenix 93.1 Mhz. Buenos Aires, Argentina, 103.1 FM Radio Milo in Mol, Belgium, Bryansk Ag Academy Local Radio in Bryansk, Russia, "The Double Trouble Show" on Osnabruecker Radio 104.8 FM in Osnabruck, Germany,"El Autoblues Program" on FM 104.8 Radio Economia in Bizkaia, Spain, and several others inluding stations in Louisville, KY, Dayton, OH, and Orlando, FL. Internet stations include Online Rock Radio at onlinerock.com and "The Upper Room with Jim Kelley" at live365.com/stations/funk7. In addition, Brent was the recipient of the Director’s Award in the 2006 Nashville International Songwriting Competition, was a finalist in the 2006 Compo 10 International Blues Songwriting Competition, and his song "Destination Anywhere" was featured the first week of Oct. 2006 on the nationally syndicated "Blues Deluxe Radio Hour." He was also recently named the runner up in the 2007 "G3" Guitar Playoffs, and was voted "Best Band in Richland County" in the 2007 Olney Daily Mail People's Choice Awards. Brent Rubsam proudly endorses In Tune Guitar Picks, check em out! !